WASHINGTON (CNS) — Two systematic theologians examined how power and clericalism among Catholic clergy played a role in creating the sexual abuse crisis that has rocked the church anew since June during a daylong Catholic University of America conference. 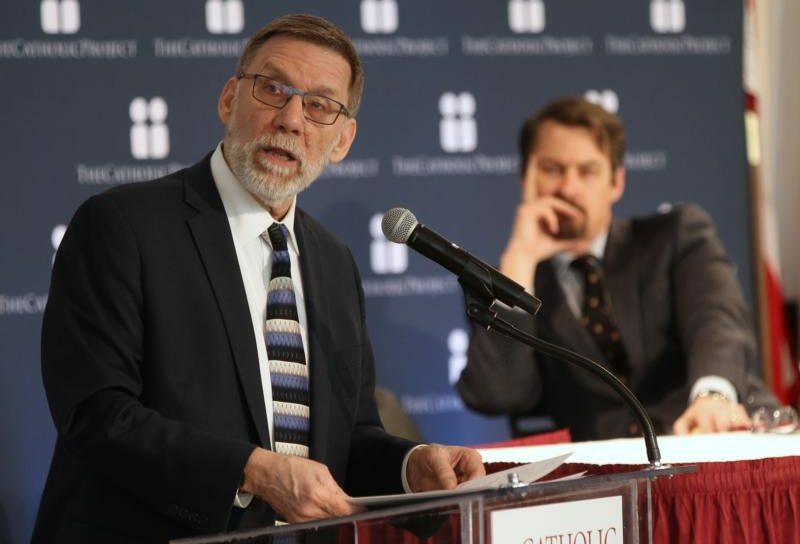 While offering differing perspectives, Richard Gaillardetz of Boston College and Chad Pecknold of The Catholic University of America agreed March 26 that clericalism needed to be addressed if the church is to begin recovering from the scandal. Pope Francis has described clericalism as an attitude embraced by priests and bishops in which they see themselves as special or superior to others. On the other hand, Pecknold theorized that clericalism stems from a willingness to turn away from God and the call to true priestly ministry as exercised by Jesus rather than solely the desire to maintain power and influence over others. The theologians supported their arguments in presentations during the latest in the university’s ongoing “Healing the Breach of Trust” conferences. The conference was the third in a series sponsored by the school’s Catholic Project, which was formed in 2018 to examine the clergy sexual abuse scandal after it erupted again last summer. Subtitled “What’s Really Going On? The Root Causes of the Current Crisis,” the conference’s sessions also explored the role of organizational behavior, sexuality and sexual teaching, and how the media reflects the causes of clericalism. Gaillardetz argued that the seeds of clericalism rest in the current theology, structures and practices associated with being a bishop. Documents from the Second Vatican Council, he said, support the ideas that place a bishop first in how he relates to the entire college of bishops or in relation to the local church. “Yet today church law and custom continue to accentuate the bishop’s relation to the episcopal college as a whole and the pope in particular and attenuate his relationship to his flock,” he said. Gaillardetz identified church practices that he believed “played a role in sustaining and entrenching clerical culture.” He pointed to the Vatican’s practice since the 19th century of appointing bishops with “minimal input” from local churches, frequent transfers of bishops “often as a form of ecclesiastical promotion” from small dioceses to more prestigious ones, and the use of titles such as “your excellency” for bishops, “your grace” for archbishops and “your eminence” for cardinals. Priestly formation also, he said, could be removed from the “quasi-monastic seclusion” of a seminary and be based in the realities of parish ministry. He called for wider involvement of the local church, including laity, in the selection of bishops, as was practiced especially during the first four centuries of Catholic Church’s history. Pope Francis’ call to synodality, the inclusion of many voices in the affairs of the church, also offers a way forward, Gaillardetz said. Addressing the theological roots of the crisis, Pecknold called for firmer grounding of seminarians in church teaching that stresses God as father. He particularly cited Pope Benedict XVI’s 2005 encyclical “Deus Caritas Est” (“God Is Love”) as offering a way forward for the church in understanding God as father. Pecknold also expressed concern about celebration of Mass, calling for the liturgy to be “celebrated with the greatest possible reverence for the Lord.” He returned to the writing of Pope Benedict, who said liturgical theologians had taken “great liberties” with the directions on liturgical reform in Vatican II documents.